I am such a coffee lover, especially if it’s full of flavoured syrups (not good for you I know) but this is the first time I have heard of spiced pumpkin lattes and I definitely wanted a go at making one, especially as I’m a little pumpkin obsessed right now :D.
I haven’t tried the famous Starbucks version but I’m sure this is just as good. This recipe involves using Pumpkin Spice, something I think you can only get in America, but I’ve made my own. To make this spice simply mix together 1 tablespoon cinnamon, 1 teaspoon ground ginger, 1 teaspoon nutmeg and 1 teaspoon mixed spice. Leave your spice mix in a small jar or just simply a sandwich bag. I admit I don’t think I could drink this every morning but I would definitely make it on a Sunday afternoon, or put in a thermos flask to enjoy on a lovely cold, crisp walk. If a normal coffee is your thing, be sure to check out this guide on the best milk frothers on Cook Bake Eat. Have you ever tried the Starbucks version? How does mine compare? Leave any feedback at the bottom of the page! In a pan heat through the pumpkin puree, pumpkin spice and pepper for 4 minutes. Add the milk and whisk continually so all the pumpkin has blended in smoothly with the milk. Whilst the milk heats, make your espresso shot. Just as the milk is about to boil, pour your espresso in to your cup and top with the heated milk. Mix. 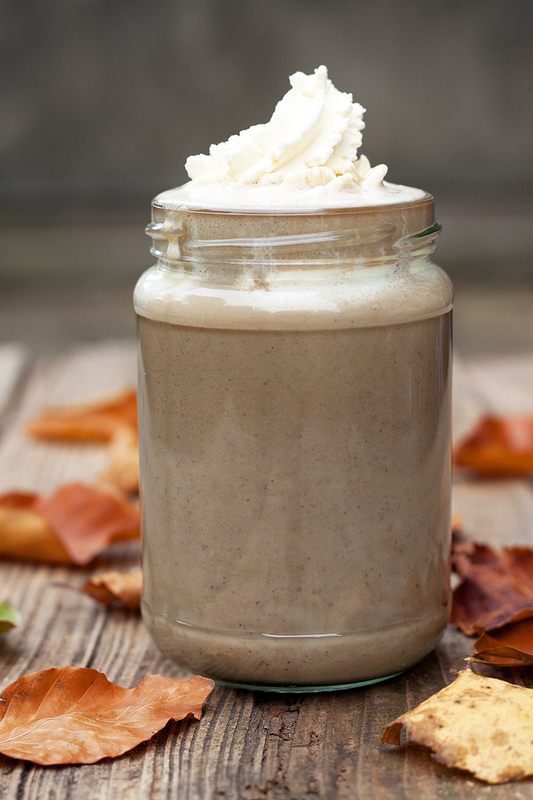 Top your delicious, warm pumpkin coffee with whipped cream, cocoa powder or nutmeg! Enjoy! Yummy! I love pumpkin spiced things. I’ll definitely try making my own pumpkin spice so I can add it to whatever I’d like. Yes its so handy to have in! Look out for my next pumpkin spiced cake recipe! So awesome to meet a fellow coffee lover! I have two websites dedicated to coffee, all made out of sheer love. Thank you for this recipe, I am pinning it for future use. It is so new to me I think they are amazing! I need to get creative and think of Christmas inspired flavour, maybe minced pie?!! Thank you, yes do. It’s wonderful all the different things you can use pumpkin puree in! This looks really yummy. Love pumpkin spice. Pinned!!! Thanks! I think I’m going to experiment a little more with some other coffee recipes!